Department of Pharmacology, Nandha College of Pharmacy and Research Institute, Erode - 638052, Tamil Nadu, India. ABSTRACT: Linezolid has a better choice for the eradication of both community and hospital acquired methicillin-resistant Staphylococcus aureus (MRSA) infections, but its use is limited because of its complications. The study elucidated the efficacy and complications of prolonged therapy of linezolid in MRSA infected rats. The rats were rendered neutropenic by an intraperitoneal injection of cyclophosphamide injection given for 4 days and 5th day at a dose of 150 mg/kg and 100 mg/kg, respectively. This neutropenia was maintained for 5 days. The neutropenic rats were injected subcutaneously with 106 CFU/ml of MRSA. The rats were divided into 3 groups. Normal control, Infected, Infected animals treated with linezolid 50 mg/kg/twice/day for 14 days. On the 15th day, the blood and liver were collected for biochemical and histopathological examination. The MRSA was confirmed by PCR assay. The minimum inhibitory concentration of linezolid was 0.5-2 µg/ml. The decreased bacterial count (7.22 × 103 CFU / abscess), intestinal alkaline phosphatase (IAP), increased lactic acid, alteration in hematological parameters and liver damage were seen in linezolid treated infected rats when compared to normal animals. Our study concludes the prolonged use of linezolid cause intestinal dysbiosis, myelosuppression, mitochondrial toxicity, and hepatotoxicity. INTRODUCTION: Methicillin-resistant Staphylo-coccus aureus (MRSA) is a specific gram-positive "Staph" bacteria that is most often causes pneumonia, surgical infections, catheter infections and invasive infections such as soft tissue infections, heart valve infections, bone infections, dental and bloodstream infections 1. It is often resistant to several types of antibiotic treatments. That makes it harder to treat someone who gets an infection. Stronger, more selective, expensive, and intravenous antibiotics may be needed to treat MRSA infections 2. Furthermore, currently available antibiotic to treat MRSA infection is limited. Linezolid, tigecycline, clindamycin, vancomycin, and daptomycin showed efficacy, safety, clinical cure and eradication rates in MRSA 3. The Linezolid (LZD) is oxazolidinone antibiotic superior over vancomycin in the eradication of MRSA 4. LZD has a unique structure and mechanism of action, which targets protein synthesis at an exceedingly early stage. LZD has 100% bioavailability, when given orally and allows conversion to oral therapy when the patient is clinically stable. It reduces the length of hospital stay, cost, intravenous infections and increased patient convenience 5. Consequently, LZD has no cross-resistance with other commercially available antimicrobial agents. Linezolid-resistant Staphylococcus aureus is uncommon, with >99% of isolates being susceptible in surveys 6, 7. Linezolid is a relatively safe antibiotic when given for short periods. It is well tolerated, with myelosuppression, mitochondrial toxicity being the most serious adverse effect 8. Prolong LZD therapy is needed for MRSA infections in prosthetic joint and diabetic wound infection. The present study was undertaken to evaluate the efficacy and complications of prolonged LZD therapy in MRSA infected subcutaneous abscess model. Drugs and Chemicals: Linezolid were obtained from Sigma-Aldrich Chemical Pvt. Limited, India. All other drugs and chemicals used in the study were obtained commercially and were of analytical grade. For estimation of biochemical tests, kits were obtained from Ecoline, Manufactured by Merck Specialties, Private limited, Ambernath. Experimental Animals: The Wistar rats (200-250 g) were maintained in clean, sterile, polypropylene cages with paddy husk as bedding. Animals were housed at a temperature of 25 ± 2 °C and humidity of 30-60%. A 12:12 h light and the dark cycle were followed. All the experimental procedures and protocols used in this study were reviewed by the Institutional animal ethics committee (688/2/ CPCSEA) and were by the guidelines of the IAEC. Animal care was given as per the guidelines of Committee for Control and Supervision of Experiments on Animals (CPCSEA). Microorganism: The clinical isolate of MRSA with positive in both Panton-Valentine leukocidin (Pvl) toxin and methicillin resistance (mecA) gene were obtained from the ARM laboratory, Erode, Tamil Nadu, India. PCR Screening: A duplex-PCR was used to screen the presence of mecA and luk S/F-PV (which encode the PVL S/F bicomponent proteins) genes 9. For rapid DNA extraction, 2 - 5 colonies were suspended in 100 μl of molecular-grade water (Qiagen, Germany) and heated in a boiling water bath for 10 min. After centrifugation at 10,000 rpm for 10 min, 1 μl of the supernatant (DNA template) was added to 20 μl of the PCR reaction mixture (Invitrogen, USA). The reaction was carried out using the following conditions: an activation step at 94o C for 5 min, followed by 30 cycles of initial-denaturation at 94 ºC for 30 s, 50 ºC for 30 s, and 72 ºC for 30 s, ending with a final extension step at 72 ºC for 7 min, and followed by a holding step at 4 ºC. The PCR products were analyzed by gel electrophoresis with 2 percent agarose in Tris/Borate/EDTA buffer with ethidium bromide (5 μg/mL) and visualized by UV-transillumination. A 100 bp DNA ladder (Invitrogen, USA) was used as a marker Duplex-PCR yielded the products with sizes of 433 and 310 bp which corresponded to lukS/F-PV and mecA genes respectively. Determination of MIC using Broth Microdilution Assays: Microbroth dilution assays were performed according to the Clinical and Laboratory Standards Institute guideline (CLSI) 10. A single colony was transferred and incubated overnight at 37 °C with Mueller Hinton broth. The diluted culture was measured for the absorbance at OD620 to get a concentration of 1 × 106 CFU/ml. A total of 100 of the freshly diluted cultures and serially diluted antibiotics were dispensed into 96-well culture plates. The plates were incubated at 37°C for 16 to 18 h. The last well in the series without any visible growth was read as MIC. Experimental Design: Rats were rendered neutropenic by intraperitoneal cyclophosphamide injections given for 4 days and 5th day at a dose of 150 mg/kg and 100 mg/kg, respectively. This neutropenia was maintained for 5 days. The neutropenic rats were injected subcutaneously with 0.2 ml of the MRSA suspension containing approximately 106 CFU/ml in 5% hog gastric mucin 11. Animals received treatment of anti-infective compounds starting 2 h post infection. Linezolid was administered orally at a dose of 50 mg/kg twice daily for 14 days 12. Group III: Infected rats treated with linezolid 50 mg/kg twice daily. On 15th day animals were anesthetized, and blood samples were collected into EDTA added vials for hematological study and into dry non-heparinised tubes for serum biochemical profile, and the serum was separated by centrifuging at 3000 rpm for 15 min. The abscesses were excised, added to 2 ml of heart infusion broth, and homogenized. A standard plate procedure determined the number of viable organisms in the abscess (the number of CFU per abscess) with mannitol salt agar. The liver tissue portions were dissected and then fixed in 10% formalin for histopathological studies. Sections of 5-6 μ thickness were prepared and stained by hematoxylin and eosin staining agents. Preparation of Intestinal Homogenate: The intestine was removed, flushed with saline and washed again. The mucosa was scraped off with the help of a microscopic glass slide. 10% w/v of the mucosa was mixed with 5 mM EDTA (pH-7.4) and homogenized with Teflon pestle. The homogenate was centrifuged, and the supernatant liquid was used for estimation of intestinal alkaline phosphatase (IAP). Statistical Analysis: The data are expressed as the mean ± standard deviation (SD). GraphPad Prism software was used to analyze data and construct the graphs. One-way analysis of variance (ANOVA) followed by Dunnett's test. The values of p<0.05 were regarded as statistically significant. 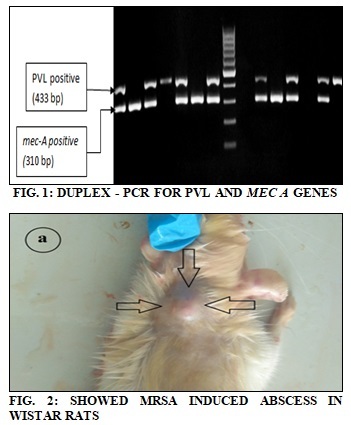 In-vitro Antimicrobial Activity: The clinical isolate of MRSA was confirmed by duplex PCR Fig. 1. The clinical and laboratory standards institute clinical breakpoints were considered for interpretation of linezolid MIC (sensitive ≤4 µg/ml and resistant ≥ 8 µg/ml) S. aureus ATCC 29213 was used as a control strain for MIC detection. MRSA isolates tested, was sensitive to linezolid ranged from 0.5 µg/ml - 2 µg/ml. linezolid showed well in-vitro activity against MRSA isolates and can be considered for the treatment of these infections. Bacterial Count: The number of viable organisms in the abscess (number of CFU per abscess) showed in Table 1. The infected animals showed 4.20 × 106 CFU/abscess Fig. 2a. The infected animals treated with linezolid showed a significant reduction (7.22 × 103 CFU/abscess) in the bacterial count when compared to infected animals. Hematological Parameters: We found a significant reduction (p<0.01) in RBC, WBC, PLT, and Hb in linezolid treated infected animals Table 2 when compared to normal animals. These findings suggest linezolid treated animals exhibited myelosuppression. Values are mean ± S.D; n=10 in each group; ns P>0.05 and ** P<0.01, when compared to normal control (one way ANOVA followed by Dunnett’s test). Lipid Profile: The linezolid treated infected rats shown Fig. 3 no significant (p>0.05) change in the cholesterol and triglycerides in comparison to the normal group. Serum Hepatic Biomarker: The linezolid treated infected rats shown Fig. 4 significant (p<0.01) elevation in the AST, ALT, ALP, LDH levels in comparison to the normal group. It indicates it prolong LZD treatment induce liver damage. The linezolid treated infected animals showed 2.19 mU/mg of IAP represented in Fig. 5. Values are mean ± S. D; n=10 in each group; #P>0.05 when compared to normal control (one way ANOVA followed by Dunnett’s test). Serum Biochemical Parameters: LZD treated infected animals showed Fig. 6 significant (p<0.01) elevation (20.1 mg/dl) of lactic acid and bilirubin indicates liver damage, but no substantial change in urea and creatinine when compared to control. The elevated lactic acid is the marker for mitochondrial toxicity. FIG. 6: EFFECT OF LINEZOLID ON LACTIC ACID, UREA, CREATININE, AND BILIRUBIN IN DIFFERENT EXPERIMENTAL GROUPS. Values are mean ± S.D; n=10 in each group; #P>0.05, ** P<0.01, when compared to normal control (one way ANOVA followed by Dunnett’s test). Fig. 7 (a-c) showed histopathology of liver under 40X magnification. Fig. 7a control rats showed normal liver cells. Fig. 7b Infected rats showed normal hepatocytes. Fig. 7c Linezolid treated infected rats showed macrovesicular steatosis (star). Histopathological Results: Histopathological findings were shown in Fig. 7. Microscopic examination of control and infected rats showed normal hepatic architecture Fig. 7a and b. The LZD treated group revealed macrovesicular steatosis and apoptotic hepatocytes with diffuse vacuolization of hepatocytes Fig. 7c. DISCUSSION: MRSA is a predominant pathogen for complicated skin and soft tissue infections (SSTIs). MRSA infections are characterized by liquefaction of infected tissue and abscess formation; the resulting cause’s ischemia and necrosis. Hematogenous dissemination causes septicemia and spread to other organs pose higher risks of mortality and functional disability 13. Linezolid is a better option to treat MRSA diabetic and orthopedic infections. Eradication of these infections requires long-term therapy of linezolid. In our study linezolid used for 2 weeks against MRSA infected rats. It causes severe hematological toxicity (decrease RBC, WBC, PLT, and Hb) are mainly due to myelosuppression, immune-mediated mechanism and oxidative stress have an essential role in the structural and functional damages of hemocytes 14. Waldrep et al., 15 demonstrated that linezolid treatment increases the iron saturation in the bone marrow and cause a reduction in RBC and Hb content. Antibiotics cause dysbiosis, an imbalance in the number and composition of intestinal bacteria, which facilitate the growth of opportunistic bacteria. Gut enzyme IAP Physiologically, exhibit many functions, including decreasing dietary fat absorption and detoxifying bacterial toxins. In our study, the LZD treated rats showed a diminished level of IAP and caused alterations in the microbiome, intestinal inflammation, and intestinal permeability. The other orally entered bacterial endotoxins easily penetrate the intestine and increase the risk of bacterial disease. LZD treated rats showed macrovesicular steatosis in liver cells due to an accumulation of fat and fatty degeneration, but no alteration in circulatory lipid levels. The LZD administration in infected rats showed elevated hepatic enzymes indicates hepatotoxicity. Lactic acidosis is a common burden for intensivists. Nevertheless, clinical studies revealed the incidence and outcome of lactic acidosis are infrequent and are both retro and prospective with small sample size 16. Lactic acidosis is a condition in which > 4-5 mmol/l of serum lactate causes metabolic acidosis. LZD inhibits bacterial protein synthesis by binding residues in the 23S ribosomal RNA of the 50S bacterial ribosomes. LZD binds to human ribosomes, leading to a decrease in the activity of respiratory chain complexes having mitochondrial DNA-encoded subunits and decrease the protein of the complexes, due to similarities between bacterial and human ribosomes. The patient with LZD therapy decreased the mitochondrial enzyme activity in tissues. LZD is metabolized mainly by the liver, and the liver also metabolizes more than 60% of lactic acid. Therefore, liver dysfunction can be considered as a risk factor for LZD-induced lactic acidosis. In the case of patients with lactic acid, overload leads to death. The linezolid induced lactic acidosis due to mitochondrial DNA polymorphisms 17. The deposition of lactic acid induced by LZD also damages to organs such as liver and kidney. CONCLUSION: The present study concludes that linezolid has effectively acted against soft tissue MRSA infections. The prolonged use of linezolid causes intestinal dysbiosis, myelosuppression, mitochondrial toxicity, and hepatotoxicity. Toxicities produced by prolonged linezolid therapy must be tested against MRSA infected different diseased population. ACKNOWLEDGEMENT: It is proud to express my sincere thanks to our management Nandha College of Pharmacy, Erode, with a deep sense of gratitude for his encouragement, co-operation, kind suggestions and providing the best facilities during this work. Garau J, Bouza J, Chastre F, Gudiol S and Harbarth: Management of methicillin-resistant Staphylococcus aureus Clinical Microbiology and Infection 2009; 15(2): 125-136. Christian E and Mathew D: Treatment of complicated skin and soft-tissue infections caused by resistant bacteria: the value of linezolid, tigecycline, daptomycin, and vancomycin. 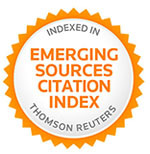 European Journal of Medical Research 2010; 15: 554-563. Li M, Xiaojuan Z, Xingin Z, Lujing Z and Yuanyuan Q: Comparison of efficacy of linezolid and vancomycin for treatment of hospital-acquired pneumonia: A meta-analysis. Biomedical Research 2017; 28: 3420-3426. Jason F and David G: Intestinal Alkaline Phosphatase: A summary of its role in Clinical Disease Journal of Surgical Research 2016; 202: 225-234. Jones RN, Ross JE, Castanheira M and Mendes RE: United States resistance surveillance results for linezolid (LEADER Program for 2007). Diagnostic Microbiology and Infectious Diseases 2008: 62: 416-426. Sader HS and Jones RN: Antimicrobial susceptibility of Gram-positive bacteria isolated from US medical centers: results of the Daptomycin Surveillance Program (2007-2008). Diagnostic Microbiology and Infectious Diseases 2009; 65: 158-162. Taeksun S, Myungsun L, Han-Seung J, Yumi P, Lori ED, Veronique D, Dean F, Jing W, Lisa CG, Kennet NO, Yingda X, Laura EV, Sang NC, Clifon B and Ray YC: Linezolid trough concentrations correlate with mitochondrial toxicity-related adverse events in the treatment of chronic extensively drug-resistant tuberculosis. EBio Medicine 2015; 47: 2507-2512. Mcclure JA, Conly JM, Lau V, Elsaed S, Louie T, Hutchins K and Zhang W: Novel multiplex-Pcr assay for detection of the Staphylococcal virulence marker Panton-Valentine Leukocidin genes and simultaneous discrimination of methicillin-susceptible from resistant Staphylococci. Journal of Clinical Microbiology 2006; 44: 1141-1144. Wayne PA: Clinical and Laboratory Standards Institute. Methods for dilution antimicrobial susceptibility tests for bacteria that grow aerobically; approved standard, CLSI document M7-A7, Seventh edition 2006. Masakatsu T, Morio T, Hideaki M, Jingoro S and Shogo K: In-vivo antibacterial activity of S-3578, a new broad-spectrum cephalosporin: Methicillin-Resistant Staphylo-coccus aureus and Pseudomonas aeruginosa Experimental Infection Models. Antimicrobial Agents and Chemotherapy 2003; 47: 2507-2512. Mustafa S, Suzan S, Iiknur K, Nural C, Zafer T, Semra TK, Ali A, Faruk OD, Ahmet B and Huseyin T: Efficacy of linezolid in the treatment of mediastinitis due to methicillin-resistant Staphylococcus aureus: an experimental study. 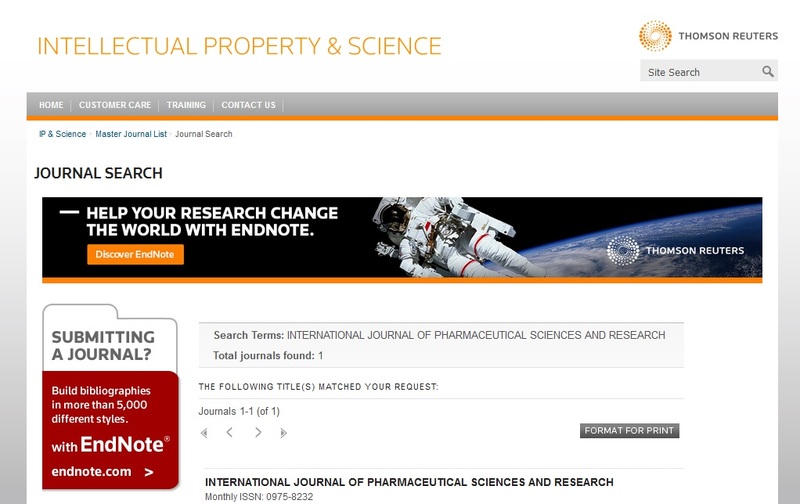 International Journal of Infectious Diseases 2008; 12: 396-401. Ki V and Rotstein C: Bacterial skin and soft tissue infections in adults: a review of their epidemiology, pathogenesis, diagnosis, treatment and site of care. Canadian Journal of Infectious Diseases and Medical Microbiology 2008; 19(2):173-184. Tianlin W, Daihong G, Xianzhe D and Lihua M: Effect of linezolid on hematological and oxidative parameters in rats. The Journal of Antibiotics 2014; 67: 433-437. Waldrep TW and Skiest DJ: Linezolid-induced anemia and thrombocytopenia. Pharmacotherapy 2002; 22: 109-112. Antoine K, Emmanuel N, Thomas A, Nicolas D and Bruno L: Hemodynamic consequences of severe lactic acidosis in shock states: from bench to bedside. Critical Care 2015; 19: 175. Apodaca AA and Rakita RM: Linezolid-induced lactic acidosis. New England Journal of Medicine 2003; 348: 86-87. Lalitha V and Sivakumar T: Efficacy and complications of prolong linezolid therapy in methicillin-resistant Staphylococcus aureus (MRSA) infected subcutaneous abscess model in Wistar rat. Int J Pharm Sci & Res 2019; 10(4): 1719-24. doi: 10.13040/IJPSR.0975-8232.10(4).1719-24. Authors Address: Department of Pharmacology, Nandha College of Pharmacy and Research Institute, Erode, Tamil Nadu, India.